I'm an alien from another sphere. The thing I like about the Earth is the range of colors, fantastic to mundane, brilliant to dull. As I was penetrating the ozone, I perchance to notice the orange peel like quality of light playing upon the ocean. I got to go right now. Someone is videotaping me in my spaceship. All around the watertank just a-waitin' for a train. A thousand miles away from home just for in the rain. I walked up to a brakeman just to give him a line of talk. He said, "If you got money, I'll see that you don't walk." "I haven't got a nickel, not a penny for to show." "Get off! Get off, you railroad bum!" and he slammed the boxcar door. The moon and stars above me... and what else? "Waitin' for a Train" has a somewhat strange history with Beck. It appears on Stereopathetic Soulmanure, but is actually sung by a homeless guy named Ken. He sings to no music, and ends up forgetting the words. Beck can only be heard way in the background on a couple of lines. As Beck recalled, "There was a hobo by the side of the freeway exit, he had a big beard and I just went down there with a tape recorder one day and started talking to him and we liked a lot of the same musicians. I said 'Do you know Waiting For A Train?' So he started singing that and a bunch of other songs." As that implies, Beck knows and is familiar with this song himself. Ken may be obscure, but his song choice was not. Jimmie Rodgers was a country singer and songwriter from the 1920s, his songs are almost all timeless classics. In turn, Beck himself has performed "Waitin' For A Train" a few times live over the years. (He has also played Rodgers' "Peach Pickin' Time In Georgia"). "Waitin' for a Train" initially only showed up on special gigs, like KCRW radio shows, Steve Hanft movie premieres, or opening for Bob Dylan. 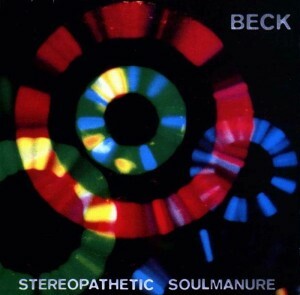 Beck played a spontaneous version of "Waitin' for a Train" on KCRW on June 19 1996. He was talking about the title of Odelay, and admitted a lot of people think it's a yodeling reference. Jimmie Rodgers was known as The Yodeling Brakeman, so Beck busts out into the first verse of the song. He hits the yodeling section, yodels a bit, before singing, "It's been too long since I've been yodelin'!" He disclaims, "I'm just shouting. That's not real yodeling." On September 1 1996, Beck improvised his setlist. Suggestions from the audience are completely useless ("play 'I Am Lonely'!" someone keeps insisting, while someone else shouts for "Dead Wild Cat") so he decides on a little Jimmie Rodgers "just to get in the spirit." He has a little fun with the yodeling too, giving warnings mid-song like ("Alright, here comes the yodeling... just want to warn you... don't want to give you any yodeling whiplash... Yodelay-eee!... That doesn't sound good, my apologies"). It's a warm performance though. "Waitin' For A Train" was also played on February 13 1997, but just a verse of it was tacked on to the end of "Sleeping Bag." An interesting combination! Beck used "Waitin' For A Train" to open the "Bob Dylan festival" on December 16 1997. This was a string of five nights Dylan played at a small club in Los Angeles, and Beck opened for him on the first show. "I'm gonna kick this off with a Jimmie Rodgers song," Beck announced. The crowd of Dylan fans appreciated it. His voice sounds a bit frail, as Beck was coming off an illness that night, but it really suited this song in particular. Beck played the song for the first time in awhile on August 3 2002 in Portland. It was done as a duet with Smokey. One of them (probably Beck) was on acoustic guitar, and the other on banjo. Beck played "Waitin' For A Train" at his appearance for the Newport Folk Festival in 2013; a show/situation like that certainly calls for some old folk/country/blues. Beck also performed it twice in 2015. The first was at a show in which Willie Nelson co-headlined. During Beck's opening acoustic set, Willie came out and duetted with him on "Waitin' For A Train." The lead-off sample on Stereopathetic about the alien in his spaceship is from Steve Hanft's film, "Normal." Ross Harris is the voice.